This set of four easy-roll locking casters adds smooth mobility to shop stands and more. A foot brake locks both the wheel and swivel, while 1'' (L) x 3/8''-16 threaded stems fit a variety of shop stands (except Rockler Shop Stands and Router Tables). 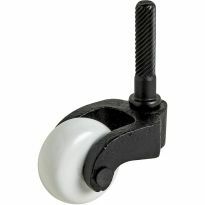 Features 2-1/2" diameter wheels with quiet, ball-bearing swivel. Load rating: 110 pounds per caster. Machine stand casters for equipment mobility. 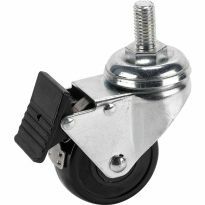 Great casters that lock from rotating as well as swiveling. Works great on my home made machinery stand that has a grinder and belt sander mounted on it. Casters allow be to move the machine stand wherever I need it in my shop. Excellent casters. Brake holds tight and prevents rolling or twisting. Worked perfectly for me and nice addition to my work shop. Sturdy design, smooth operation, positive lock up. First time purchase of these caster sets. I ordered two sets. Very impressed with these. They are well made , operate smoothly, they feature wheel and swivel lock up. Lock up is clean and positive. These casters are a good value. 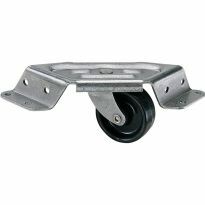 I have used these in the past and will use them in the future, total locking casters they are ideal for many applications. This is my second set, I like them real well. Roll easily and are heavy duty enough to handle about a 300lb machine I have with no problem. Mounted these on multiple machines in my basement shop. They work well. I like how the lock prevents the caster from pivoting when wheel is locked. They were just what was needed to make my multi tool table mobile. They swivel, the wheels go around and the brakes work, what more do you need. I have an older model Craftsman router table that was always a bear to move around on the rubber feet. These casters attached with no modifications and work great. Once I get the table in position, I lock the wheels and the table stays put! set of four.. an upgraded replacement on the older ones I had.. I like the locking mechanism on this set..
Added to old Craftsman table saw stand - replacing the fixed adjustable feet. Legs made of sheet metal forming an “L”, with bottom edges folded to make a flat bottom of the leg. The casters are offset from the stem so I reinforced the bottoms of the legs to keep them from bending. (Not pretty, but ...). Ok for 3 of 4 legs, 4th bent, but added more reinforcement. Putting 4 swivel casters makes it much easier to maneuver the saw in a small shop. The lock works for both swivel and rotation. My only concern: durability of “plastic” stop lever. Getting to the adjustments on my vintage Delta 14" band saw in the tight confines of my one-car garage shop was a challenge solved by Rockler's double locking casters. Now I just unlock the casters and spin the saw as needed or roll it out for longer cuts. The previous owners wheel set required tipping the saw like a hand truck until the fixed wheels hit the floor. The single 3/8" bolt mount required no modification to the factory base and the all-direction locking keeps the saw solidly in place for cutting. I'm 6'-2" and the slightly elevated table is a bonus. Perfect for replacing the feet on my old JessEm router table. Now I can stop dragging it out every time I want to use it. Used them on a tool stand to make my drum sander mobile in my shop. I have multiple sets of these and just added them to my bandsaw and my jointer. They're smooth functioning with easily accessible locking brakes. They do take a bit of time to install. CASTERS DO EXACTLY WHAT I WANTED THEM TO DO. I have several sets of these casters in the 1/2" stem and have loved them ever since they were installed. I had a smaller, lighter-weight stand that I wanted to mobilize but the amount of metal at the foot just would not have handled a 1/2" stem. These 5/16" stems were a blessing. Now installed and the stand is now freewheeling. YAY!. 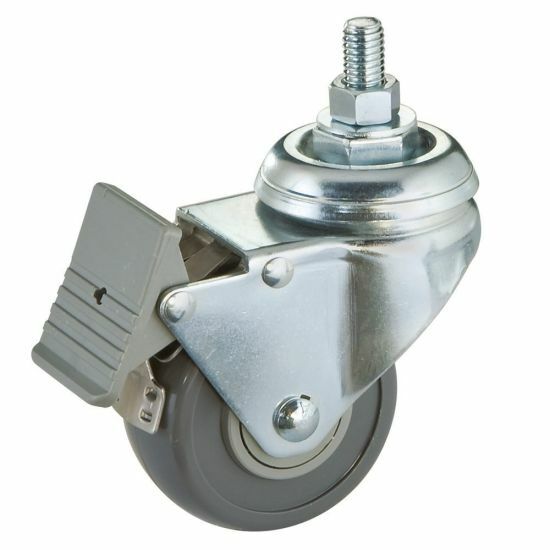 Roller wheels are very good quality, the weight capacity is very good and the locking mechanism is superior to many more expensive caster sets (locks both the roll and the swivel action). Thank you Rockler. Keep up the quality product offerings. While unrelated to the product reviewed above, my comment on the quality of Rockler products, requires me to also say I am writing a review on another Rockler product that is a complete piece of garbage and should never have been offered by Rockler. To see my review of this product look for my review on the 2 1/2" Forstner bit with the Shop Basic brandname. Works great on my drum sander. rolls around with ease. Only needed casters for my pancake air compressor. I am disabled and could not pick up my air compressor, it would throw out my back. 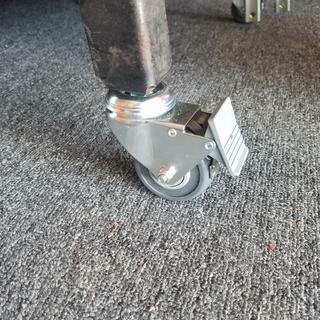 With these casters it rolls very smoothly and then I Locke the casters so the vibration would walk away the compressor. Fantastic idea if I do say so. These casters worked great on all of my power tools allowing me to rearrange my shop as needed. They also provide a stable support for the tools. They are a great value. Arrived, installed in minutes. I now have a small metal vice table on wheels. The casters worked great, just like I hoped they would. Multiple uses for shops and garages. Solid. Used for rolling cabinets, dollies for band saws and router table. Wheels are smooth and locks are solid. Perfect for rolling cabinets, tool dollies, and more. work great now. only time will tell how long the brakes work. GET SOME FOR YOUR NEXT PROJECT!!!!!!! I installed them on a sewing machine table so that I can move the 45 pound machine around the shop without any exertion at all. I like how they look and they are easy to install and to use. Worked very well for what I used them for, under a movable stand. I use the casters on a small air compressor that weighs 63 lbs. It allow me to move it around without lifting it ,locks the wheel and swivel . The wheels are sealed so they do not collect dust and won't mark the surface they set on. The low profile does not make the compressor top heavy. It makes loading in the truck easier and the locks keep it secure in the bed of the truck. Due to limited space for my shop in my two carless garage , everything has to be on casters. Prior to the stem lock casters tools would shift when pressure was applied as the casters swiveled even though the wheels were locked. 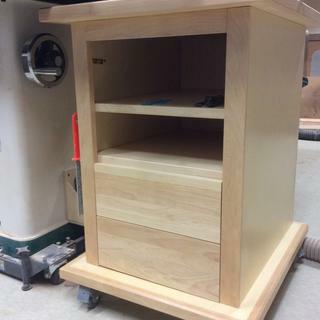 My router table, bandsaw and the stand for the jointer and the planer are all on stands with the stem lock casters and work extremely well and don't move when I need them to be stationary but are mobile when I need to move them out of the way. These casters suit my needs very well. Put these on a radial arm saw stand,easy to install and they do what I bought them for. They work well,lock easy and ,move around easy . I have a favorite shop/mechanic stool that has worn out several sets of casters but I can not find a replacement seat that I like. I seen these casters and figured I would try them. They roll and move like the floor is super smooth and the opposite is true. I love them. 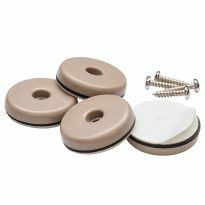 They saved me from being unhappy with a replacement stool. For years my router table has annoyed me by just sitting there stationary, and then I noticed these lockable casters at Rockler. Since I would soon have to be routing some 16 foot baseboards, I ordered these and put them on my JessEm table. The 3/8 mounting bolt worked just fine in the table, and now I can happily put the table anywhere I want and lock the caster and swivel. I'm pretty sure my table feels better about itself, too. Great casters and work perfectly with the stand I purchased. I purchased these casters to mount under a Rockler steel framed work table. They roll very easily and when locked the total lock system works very good because it locks the roll and the swivel at the same time which I feel is a nice option. They are very secure when in the lock position. Bought two sets for router table and table saw. My workshop is also the garage so these locking casters are a must-have for me. Back out the car, roll the equipment into place and lock the casters, nothing could be easier. These casters screwed right in. They came with lock nuts that I did not use only because I didn't want my router table any higher. I can now move it wherever I want, and lock the wheels. The lock nuts are nylon inserted so they are truly lock nuts and will not move without using a wrench, if you use them. This is THE answer to a locking caster system for power tool bases. I attempted to build one for my radial arm saw using individual standard hardware store locking casters and wasted about the same $ that this set cost. Moral-don't waste time and money re-inventing the wheel. I put these on a router table which had two fixed casters and one movable and now&nbsp;I can move it anywhere with no trouble. I have four sets of these casters on tools ranging from a 14&quot; bandsaw to a 2'x6' workbench/router table. The advantage of a locked stem in addition to a locked wheel is a much more rigid base. I'm very well satisfied with these casters. My vintage Sears jointer had old, inferior casters. These installed very quickly, without any modifications, and now the machines is a pleasure to move around. Quiet, smooth, a huge improvement. I ordered another set for my router table. I used them on a shop built router table a fairly massive piece with a 3hp router. They make moving the table a breeze and when locked, the table is steady. The only problem I encountered is I have 2&quot; square wooden legs on the table. I drilled holes in the bottoms of the legs to mount the shafts of the wheels. I worry that if I &quot;catch&quot; a wheel I could have enough leverage to break the wheel out of the hole. BTW when they are on sale, these wheels are a great bargain. When I bought my JessEm Excel router table, the wheels I bought had 1/2 inch stems and didn't work for the JessEm. At that time, neither JessEm or Rockler sold wheels with stems that would fit. This set has 3/8 inch stems and works great. My router table is now portable as are my other tools which makes my limited shop space much more usable. Plus the table stays very stable with the wheels locked. Good product, met my needs for a mobile base on my bandsaw. The casters are really good way better than what you can buy at a box store. They roll well and they lock well. I have put them on all of my small machines. The only thing is they should offer a set with two solid wheels. I haven’t seen that offered. We are replacing the original casters on our work table. The original casters lasted 10 years outdoors in Florida, hope these are as good. Have used these on several shop carts. They work well and I need a 3/8" stud for this application. Need it for my table saw. My downsized shop requires previously stationary tools to be rolled to the side. These castors fit my bolt-down vintage Delta band saw base without modification and appear to provide a positive lock for both wheel and swivel movement and have a more than adequate load rating. I have used these on a radial arm saw and needed another set to improve mobility on a sheet goods rack. They're sturdy, the lock works well. Previous use on shop tools. Had to move to a smaller shop and need to move some of my heavier tools around sometimes. to add to a ban saw stand. have used on other stands, they work very well. Locking caster with stem and load rating to be used with a movable kitchen island. For my lathe stand . Easily move it around shop and then to store it. mount on Jet JWL stand. Make my bench tools movable in my shop. My space is very limited. Built a small table for my shop, needed a set and had bought these before. Good buy and good product. To fit existing mounting holes in tool cabinets. Need to make a shop stand mobile, hoping that these will fit my stand. Looks like the casters I need for my radial arm saw. Need for a work table. Building a couple mobile metal stands. 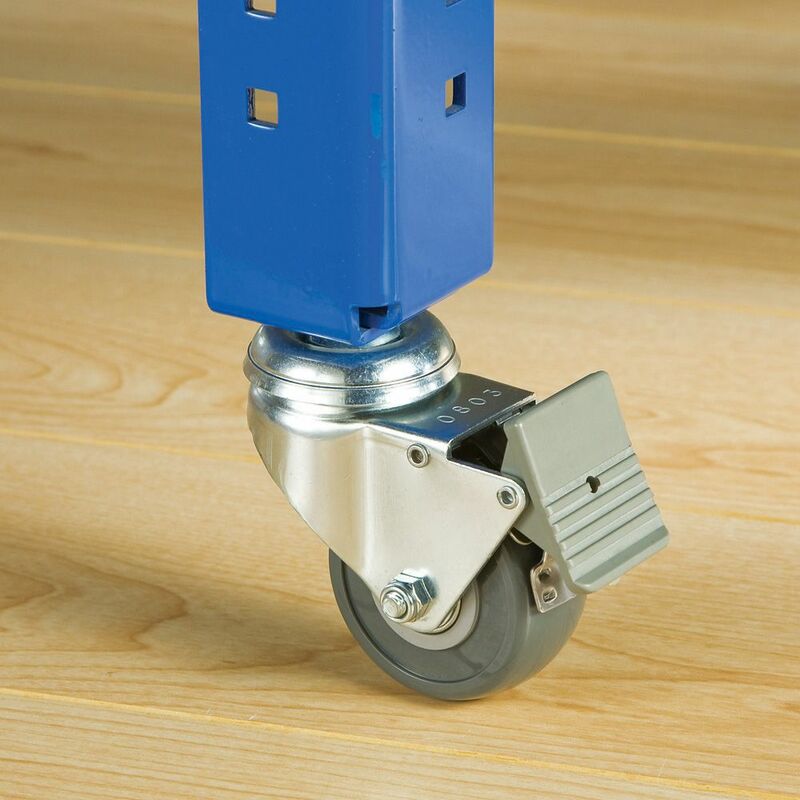 These casters are easy to mount on a piece of plate welded to the bottom of angle-iron legs. I've used these on several projects and been happy with the quality. To be able to move my table saw. I have bought these in the past and I needed more for some new tools. I need to make a metal tool cart mobile but also lockable. I have used these casters before and they work great -- better than most. The brake is easy to apply and release, and it locks both the wheel and the swivel. Needed it for router stand. I have a small shop and need to have my equipment on wheels. Could not fine lockable caster wheels locally. is there a difference between item number 34000 and item number 47034 casters other than the 3/8" stem and stem 1/2"?? i would like to install these wheels on my band saw which weighs approx. 290 pounds will this work for me? 110 lbs each, so that would be 440 lbs for 4. Yes they will work great. I have them installed on my router table, drill press and table saw. My little shop is shared with a car in our garage. This means everything has to be put away when I'm all done for the day. Nothing easier than just rolling them back against the wall. I think you'll find it money well spent. Do they work on the rockler-router-table-steel-stand? BEST ANSWER: Yes, extremely well. I installed them on my Rockler router table, table saw and drill press stand. They are well worth the investment. Happy routing! I DO NOT recommend using wheels like this on a router table. You need a stable platform that will not "drift" on you as you push your work piece across your router table. These wheels, even when locked, may rotate on you when pressure is applied to the work piece. No, not according to the description. The stems are 3/8" and the stands have 1/2" holes. Look at item 47034 which is designed for Rockler stands. Yes, they should. I have them on my jointer planer table. Yes I have them on my rocker steel router table stand. I do not know. I don't have that table. how many in the set? BEST ANSWER: Four. 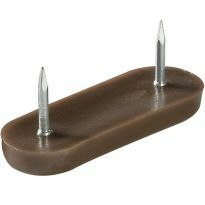 They roll great on cement slab floors and the locks work very well. There are 4 casters per set. There are 4 in the set. I want to mount these in a wooden leg on a chopping block. Are there 3/8" inserts that I could mount in the bottom of the leg? In theory it should work. 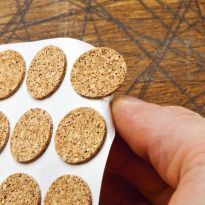 Rockler does have brass inserts. But I would concerned about a lack of long term rigidity and strength. These casters are designed to be bolted on. Hope it works for you! I have used caster brackets, Rockler part no. 26050, to attach total lock casters to wooden legs. yes, they are available at Rockler Woodworking . want locking casters for a 250 lb kitchen island and don't know how to figure out if these would work? BEST ANSWER: I used the casters for a 10" radial saw and 12" table saw. However, I used 3/4" plywood to build a base and drilled holes to feed the stem and secure the nut. I don't think this type of caster meets your need. The casters are solid and when locked the platform is secure. You might look at the side mounting casters to meet your requirements. They have an "L" bracket to allow securing the caster to the side of the item. Make sure you have sturdy brackets to bolt the casters onto and you should be fine. You would be well under the 400lbs. total capacity with a set of four. My table saw, drill press and router table each have a set of locking casters. They make all the difference in convenience. The casters are rated at 110 pounds each, so they would certainly carry the stated weight. 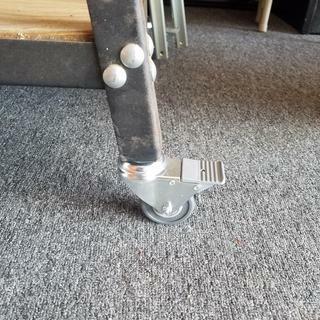 I have used these casters on many shop and equipment tables and they roll well when unlocked and lock securely enough that the table won't move under normal use. Surprised you would want these in a kitchen application where, in my mind, appearance is important. These are more for a shop environment. "not really attractive" Your wife might not be happy with you for this selection! These are nice heavy duty casters. I use them on all my shop stand and they work great. Not the least expensive on the market but I would highly recommend them. Do you have 1/2 inch stem ? BEST ANSWER: Rockler item number 47034 is a 1/2 inch stem caster with the same double-locking action as this product. I don't believe this question was intended for me but I was also looking for casters like theese with 1/2" stem could not find them. I did buy the 3/8" stem casters and they are performing very well. Actually I have both. One of my router tables has 1/2" and the other has 3/8". Either one is fine. Look and see what size hole is in your table leg. Yes.... another thing is that you have to push the locking level down to lock the wheel to tighten the nut..
Is this for outdoor use, especially in Coastal Regions? BEST ANSWER: The casters have hard rubber wheels, and plated metal hardware to prevent rusting. They should be just fine for outdoor use, but frequent lubrication (WD40) should be used. I do not see any reason why they would not be suitable for outdoor use. Assume they would be protected from rain, snow and direct submersion. They are all cadmium plated. No clue on the moisture resistance of these casters, sorry. But, they work great indoors. Very smooth running, and lock easily. are there 4 casters in a set? BEST ANSWER: Yes, and they work great. I've got sets on my drill press stand, table saw and router table. Locking mechanism is secure and craftmanship is what you would expect from Rockler, excellent. Yes, there are 4 casters in a set. You may have to buy a set of brackets if you plan on attaching the casters to a wooden legs. Yes, there are 4 casters in the set all lockable. Total Lock 3/8'' Stem Casters,Can I get replacement wheels ? I am not sure if Rockler sells replacement wheels for the 3/8" stem casters or not or if you can even install replacement wheels on them. I've got two sets that I've been using for almost three years now and the casters are still in great shape. Hope that helps answers your question. Don't know. I've used mine on a heavy workbench with drawers for 1 year+ and they're still fine. Do these casters come in a plate mount version? BEST ANSWER: No you would have to go to a 3" caster. The stem casters are 2 1/2" Go to search and key in Swivel casters and pick which ones you would like, they have several types and all are rated at 110 lbs. but watch some are just pairs and some are individual. Can you confirm that these will fit a Jessem Rout R table stand? I see a few people saying it does here but I just wanted to check as I'm in the UK so can't realistically return them if they don't fit. Thanks. The worked just fine on my JessEm router table. The mounting bolt is 3/8, which matched the old stationary feet on the table. Can these be mounted to 5’ tall 3’ wide wood storage cabinet? The sides are 3:4” thick 28” wide and bottom is an inch from bottom dado in. BEST ANSWER: I would not recommend these for a wood storage cabinet. don't think they could hold the weight. I would recommend the workbench casters or the 4 or 5 inch casters that bolt to the bottom of the cabinet. What is the diameter of the wheels? BEST ANSWER: 2 3/8 "
what material are the wheels made from? are they non-marring? BEST ANSWER: I do not know the exact material but I have used them on hardwood floors and concrete floors and have seen no marring or material marks. 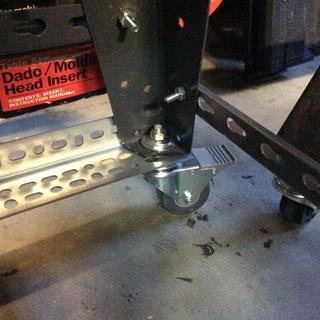 BEST ANSWER: These casters need to be inserted into a 3/8 inch threaded receptacle in the foot of the table. I do not know about the Delta table saw, but they are excellent in use on my router table. casters come with locking nuts to fit the stems? BEST ANSWER: The casters come with standard nuts with a lock washer. what is the height of the caster from the floor to the base of the cabinet? BEST ANSWER: This will raise an item 3-5/8" off the floor. how long is the stem on this caster? If it's shorter than I am looking for, is there a way to get a longer stem or lengthen it? Could I put Casters on the bottom of these legs? Will these rockler casters fit the Jet 22" scroll saw stand? I plan to purchase the saw and stand, therefore, will need casters to move it.